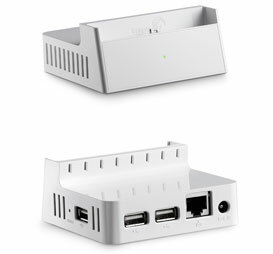 Dockstars are normally sold as NAS with cloud abilities but regarding to its price (most of time >40€ (got mine for 15€)) its a very low consumption, and it hardware spec it make this device a perfect candidate to get an always online server at home (specs here). The community and particularly Jeff doozan got very interested in hacking this device to get your own distro running on it, and they succeeded in hacking it tuto. I tried several times to flash the rescue system following this thread but without success. The last solution, was to get a running distro from usb, and in a second time install rescue system to avoid problems I'm currently experiencing. Thanks to mister pluc (www.pluc.fr), I got an USB stick with a brand new kernel and a rootfs formatted into ext4(resiliant to hot power down...) with a kernel 3.2.0-3-kirkwood, and Debian 3.2.23-1. The Rootfs partition formatted in ext4. This partion is mounted by fstab on '/' folder. The remaining tricky part is so as to be able to boot on a kernel 3.2.X. I needed to reinstall a newer version of uboot (>=2011.12) from the current uboot (version 2010.09). Before going farer, verify the minicom's connection. You can shunt with a wire the TX and RX of your serial interface and type thing in your terminal, this should echo back your charaters... if not verify your connexion. 2 - Connect the USB and the wiring on the dockstar board header. Once plugged on you should see appearing on minicom screen uboot launching message and autoboot count down press enter and access to uboot. This protocole is designed to be the simplest as possible and the lighest, you even not find a command to list content of a folder. Thanks to this lightness it can be implemented in a bootloader that must be size efficient. TFTP will be used so as to the bootloader(uboot) download from a remote host(my PC) the uboot update binary. Test the connection locally, by creating a temporay folder and download TFTP files from and to the PC. => Save the output by copy/past into a safe file. This link is a very great tutorial with the good binary you want to flash on mtd0 from Jeff doozan which is dooing a very great work on hacking low power linux devices. I will only explain the principle of the update because it already very well explained on jeff doozan forum. Now uboot 2011.12 is fully working you need to configure it to load/launch correctly your brand new debian. =>according to how your kernel is built you need or not inird utility, but in all case if kernel is built with initrd need, it will crash if it is not given at boot. You are not required to save now into flash your configs but you can test the boot and redo the same setting a second time with flash saving if the boot well completed. So if you want to only do a test go directly to Reboot step, without saving evolution in flash. Now you should be able to get the kernel booting, and obtain a login screen. If you choose to not save your configs in Uboot just restart the dockstar, re-follow instructions and save into flash this time. This "Rescuer" is a light debian system working from Flash, that allows you to restore a sytem, or re-hack an usb stick if yours burn or blew up. This is not mandatory to have one installed but it can save your time and money if problem happens on your usb stick. If like me you configured a little to small(Fatality...) your /tmp you may no be able to download all required binaries, so create a temporary folder place you inside it and edit the script to change all /tmp/ by /<your temporary_folder_path>/ and launch the script. 4 - Let it boot until the awesome blinking led alternating between green/orange for rescue system. This is important so as to easily do maintenance on the dockstar if issues appears. This netconsole will take priority over the serial console if a ping to the host machine is ok. So, if you experience some trouble with it just boot without the Ethernet plugged connected, serial will be used as console. To side are to be configured host side and dockstar side. Dockstar can be configured by to ways, configuring from the Running Debian from the USB stick/NAND. Nor setting directly from uboot. The PC has no particulare configs to do, we will use the nc tool. fw_print/fw_setenv are only uboot-utilities useable from a running distribution, and do the same job as printenv/setenv launched directly on uboot shell. On ttyS0 (Serial/JTAG dockstar's port) you will get very beginning of uboot process displaying that netconsol found the host on the network. This part is more a notes about having network working again. To understand what you need to debug your own problem is a sketch of how network is working on linux. To handle this protocol, an utils exist named dhcpcd. It may not be installed even if it is quite rare on nowaday distro. The dockstar is a great little server, and the work of Jeff doozan make it a pseudo reliable system, as a lot of utils, tools, tuto exist to debug problems that may appears. - Use the same file system architechture as mine and type due to the nature of the device hot shutdown may appear and the file system MUST be reliable to cop bad effects, EXT4 is a great candidate. - Make time to time backups of the root usbstick(with dd tools) as it cost only time and a little HDD storage, but in the end if the system crash everything is not lost and it can be easily respawn by copying back the backup image onto the USB flash drive. This took me a little bit of time to find a solution to my problem but thanks to that I discovered a lot of interesting tools (tftp, netconsole, uboot, linux boot process, linux kernel files, etc...).